I'm Unschooled. Yes, I Can Write. : I hate schools. When I think of how and what I thought just 8 or 9 months ago, I still find it hard to believe how much my opinions and worldview have changed. Take unschooling, for example. Last Spring I was going through a period of extreme doubting and uncertainty. Now, I feel that schools are the LAST place that children and teens should be forced to go. I spent some time wandering around YouTube today, and found some interesting stuff on unschooling (this video of an excerpt from one of Jensen's talks where he speaks about education was good, as were several of this guys videos on education). But it was a news segment on exercise to prevent childhood obesity, filmed in an elementary school, that got me thinking. Just seeing kids in schools makes me shudder in horror. Seem like an extreme reaction? Perhaps, but to me schools epitomize everything I hate about our society. Those in schools are brainwashed into accepting the world for how it is, instead of trying to change things. They're taught to be obedient to authority, to take what's given to them without question. Everything is regulated, numbered, scheduled. Schools do their very best to separate students from reality, to make sure their allegiance is to country, government, and whoever happens to be the boss/teacher/leader, not to the natural world, their own community, or their own hearts. Schools are institutions, and I'd say THE most powerful and influential institutions out there. Who else has children in their grasp from age 4 or 5 until 18 (assuming, of course, that students decide not to go on to university. Schools can continue until someone is well into their 20's, or even their 30's! ), taking up most of their time, forcing the students mind to be filled with whatever the school wants them to think. Schools scare me, and I hate them, because they are so very affective. “School is the advertising agency which makes you believe that you need the society as it is.” said Ivan Illich, and I find that quote to be very true. John Taylor Gatto is another man who has some very enlightening things to say about schools, and the history of their creation. "The structure of American schooling, 20th century style, began in 1806 when Napoleon's amateur soldiers beat the professional soldiers of Prussia at the battle of Jena. When your business is selling soldiers, losing a battle like that is serious. Almost immediately afterwards a German philosopher named Fichte delivered his famous "Address to the German Nation" which became one of the most influential documents in modern history. In effect he told the Prussian people that the party was over, that the nation would have to shape up through a new Utopian institution of forced schooling in which everyone would learn to take orders. 5.Citizens who thought alike about major issues. " How can anyone be in support of schools if they've done even a bit of research into their history? But I suppose people don't really research things on their own all that often, if it's not required for some test or other. Schools don't exactly encourage independant research, especially into controversial, and damaging to the institution, subjects. So having gone through school without ever being encouraged to learn for themselves, to explore, question, and not accept things at face value, how can we expect people to learn how to learn? Don't get me wrong, I do realize that some people can go through school and yet still manage to be creative, questioning individuals, but sadly this seems to be far from the norm. I just can't get over how much I hate schools. I've seen the damage they do first person so often, in the lives of my schooled friends, and in the faces of the people whom I explain unschooling to. I hate what schools, and our society, do to people. But it all starts with schools. I honestly believe that were it not for compulsary schooling, our world would not be in the awful shape it is today. With an intelligent populationthat that knew how to learn and how to question, there's no way some of the crap that's currently going on would continue. And that's why I feel that it's a calling of sorts for me to do as much as I can in my lifetime to promote unschooling, to give people the information they need to see how wrong the whole schooling institution is, and to support those who make the awesome and I'm sure very scary decision to leave school, or to take their kids out of school. RANT ON! I hated school. For years I was ashamed to admit that but I really did. These days, I--without shame--call them prisons. I resisted the whole time I was incarcerated in their brainwashing institutions. At sixteen, I got the hell outa there. That was one of the best moves I ever made. Nonetheless, life outside the box is great! And as simplistic as it may sound to some people, I found out the hard way that to follow my heart was one of the best things I could do. When I started doing what really attracted me, that's when I started to REALLY live, and, of course, really learn. The more I look deeply into the idea of 'school', the more it makes me shake my head in disbelief. I think the prevailing issue here is that most of the world truly does believe that 'school' is the be all and end all and as such, simply don't question it..they follow the herd. Their kids turn 4 or 5 or whatever age depending on where you are and then they go to school...hell, I did it to mine...for a few months, until I saw what it was doing to her. That ended mighty quick. And true, when people have been trained to accept without question, it's very, very hard for them to see that a concept they've held to be an absolute Truth...needs a serious dose of hard questioning. People need to know there are options and that they're viable - I can't count how many people have said to me "Oh, I wish I could do that for my kids but....."
Yesss!!! Thank you for posting this. It is SO important that our society understands this brainwashing that goes on 5 days a week from 8-3, to a huge proportion of our population. It drives me insane. And as you say, when you see it's effects first-hand, it is beyond unbelievable. Or the people that do manage to keep their heads on straight; they have to sort through so much rubbish to come out at least sort of sane, and unfortunately, lose their innocence in the process. Very, very sad. I am so proud of you for speaking out! Go girl!!! I understand what you are saying, how school's force you into a mindset of obey the leader, think this not that. But the thing is, what would we do without schools? 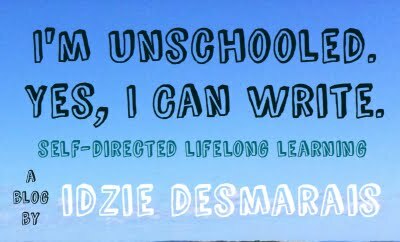 Unschooling sounds amazing, but if the whole world tried to do this there would be tons of kids who would be lazy and never try to do the sorts of things you describe to teach themselves. I know, since I am in the school system, that many kids will do anything to get out of work. If they unschooled themselves they would treat it as an everlasting vacation. I love that you and all the unschoolers I've heard about don't do that, that the reason your method works is because you are so motivated. But so many kids don't have any motivation. So yes, schools are brainwashers and teach you not to question, but what is the alternative? Just a thought. Your blog is awesome, by the way. I don't know if I am right... just what I think.. not necessarily the truth. YAH IDZIE! Rant on for sure sister! I have an MA, BA, High School Diploma and I wish there was a better way. I wanted to drop out of school in 6th grade. Wanted to drop out in college but finished. I just know in my heart and soul that the way schools are run, even "alternative ones," are not the right way. I say go to the forest or sit by one of the big Great Lakes. I have received great wisdom from places like this more so than a school environment. Well spoken Idzie...AND I rather enjoy reading your rants. * No one wants to find their passions, their "work"
Niko: Yup, the world would certainly be better off without compulsory schooling. I think our society is messed up enough that just getting rid of schools would not solve all the problems. However, in my opinion it's the perfect first step! Ojibway Migisi Bineshii: I agree. The only schooling model I support is democratic schooling, which is literally unschooling in a building, but even that I don't think is a permanent solution. Yes. I feel that the most important moments of my life were deep conversations with those I care about, and moments of absolute connection to the world around me... Moments like that are worth far, far more in terms of learning, in terms of meaning, than a thousand years of schooling.